The implementation of the tactics required to reach those goals vary from absolutely required (in the first two) to suggestions of what seems to work but you’ll want to test (the last three). I encourage you to know your customer and focus on them before creating any type of email marketing campaigns, follow-up sequences, etc. 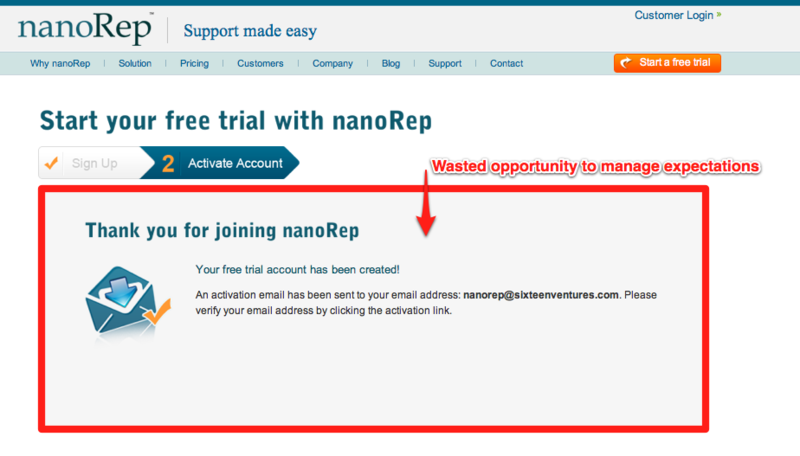 One day I was working with a SaaS vendor with a super-low free-trial-to-paid conversion rate. As I was going through their metrics, I saw that over 50% of the people that signed-up for their Free Trial never clicked the link in the activation email. After some investigation, it turned out that they had a delivery problem that was causing the email delivery to fail… they worked hard to get people to sign-up for their Free Trial and INSTANTLY turned away at least 50% of their prospects because they didn’t get the activation email! 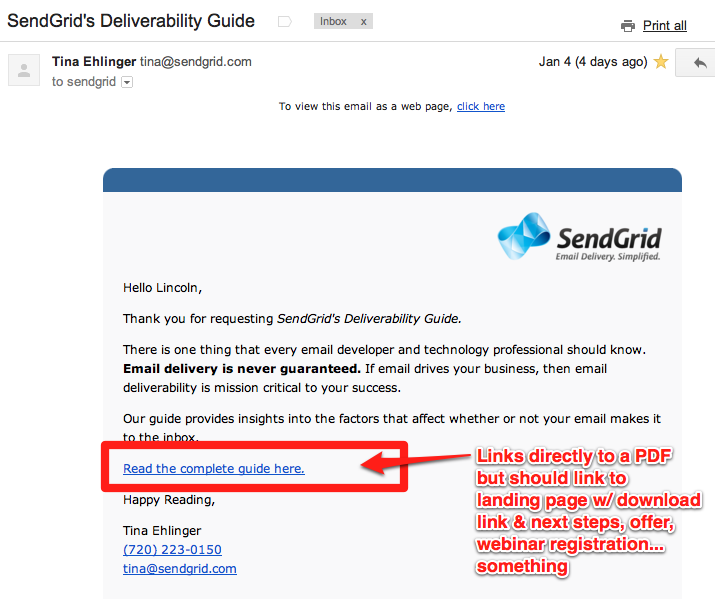 A few years ago, 37 Signals published a post on how they handle outbound transactional email themselves and get a 99.3% delivery rate… and their post shows you exactly why you should avoid doing this yourself (it takes a lot of effort!) at least at first. Honestly, there is a lot of stuff going on behind the scenes with the email infrastructure – and it’s always changing – and my opinion is that you don’t need to focus on that right now… or probably ever. This is accomplished at the DNS level in conjunction with some settings with the provider you’re using. Before you choose a solution, make sure they offer this level of authentication. Also ensure that you have the ability to do this on your end (you have to make changes to your DNS settings). Most modern outbound prospecting systems do since they’re usually built on top of Mandrill, Mailjet, or Sendgrid. And any modern systems built in the last few years – even from scratch – are going to support that. While there are behind-the-scenes reasons for signing and authenticating your emails, there is also something that’s receiver-facing that could erode trust if not taken care of. If you’ve ever seen “sent on behalf of” or “sent via” in the from part of an email – especially in GMail – it was caused by an unsigned/authenticated email. This is most often the case when third-party systems send email for you. 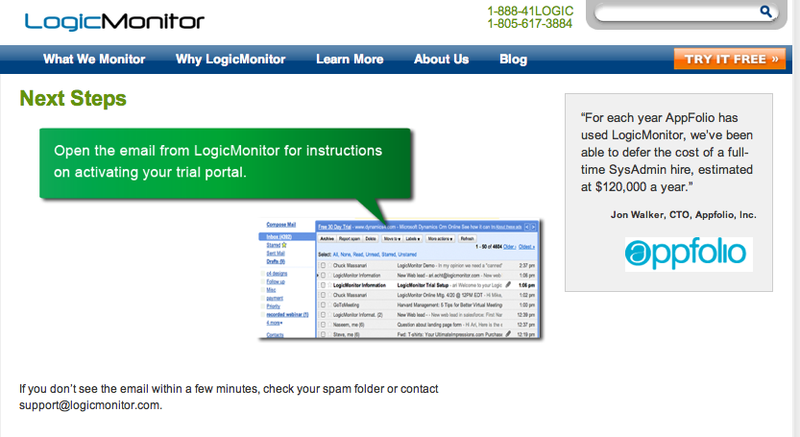 These include Email Marketing systems to CRMs to reminder services. And this is a problem because it looks like the email comes from a third-party system… it’s obvious that your “personal email” was sent through an email marketing system and therefore is automated. Not a good way to start a trusting relationship, right? Google is continuing to make changes to GMail and their changes – as they should be – are for the users of GMail (and the advertisers that pay them to get access to the inbox UI). Some of these changes – from the addition of the Tabbed Inbox to the image caching/proxy announcement of late 2013 – have the potential to massively disrupt email marketers and the way we’ve done business for years. 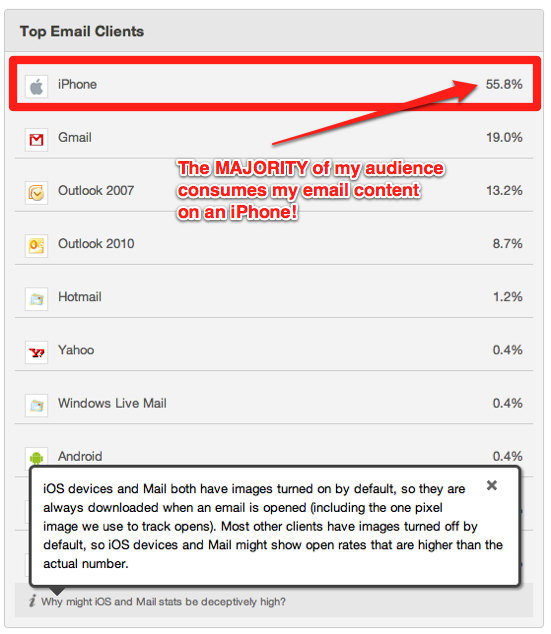 Of course, how substantially you’ll be affected by these – and future GMail changes – depends on the amount of your audience that uses GMail. One thing we can assume, however, is if GMail does something and it seems like a good idea, then other Email providers – web-based or otherwise – may start to include those, too. 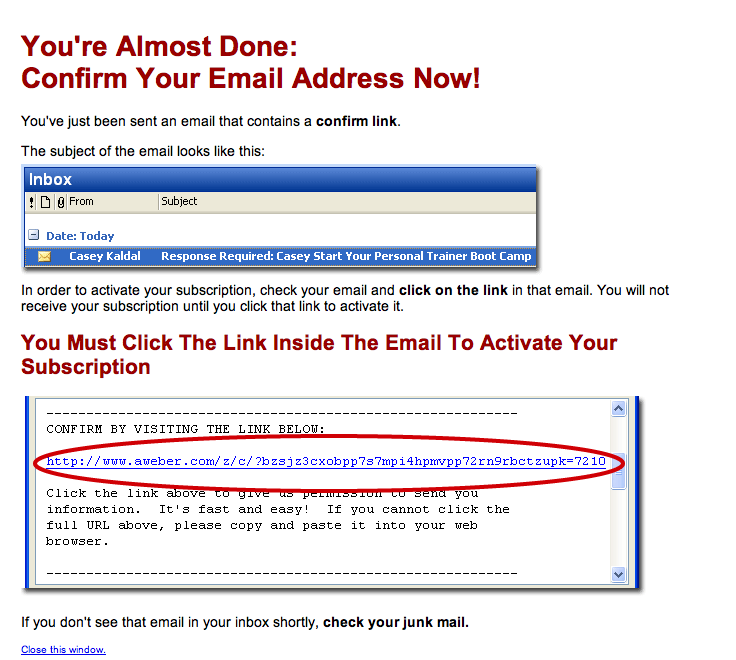 Folks in the Internet Marketing business know that getting the email opened and validated is the most important thing right then so do whatever you can to make that happen. You should look at it the same way. Send both HTML & text versions as email systems that identify a piece of bulk mail but fail to see both versions will often see that as SPAM. 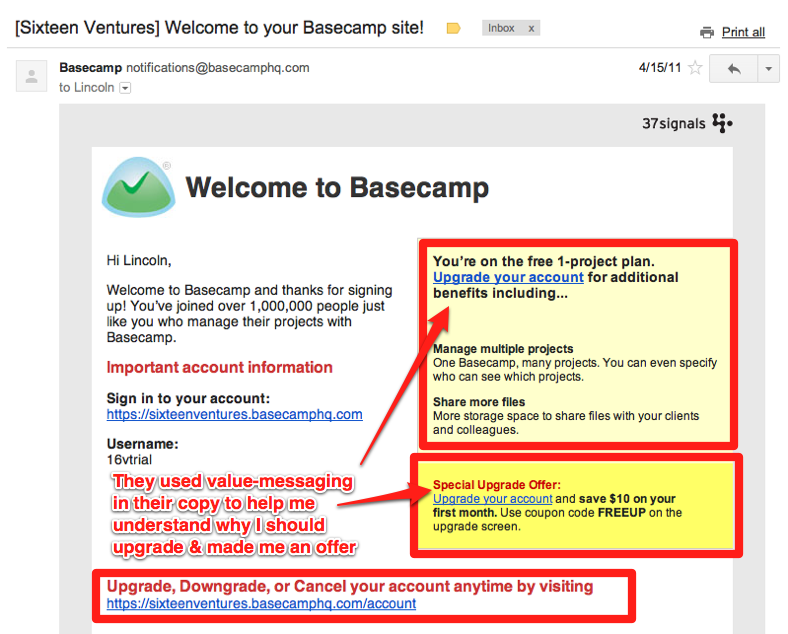 Here’s a great post that also talks about the problem of email “from:” fields and SaaS / Web Apps…. See which subject line – even in transactional emails – results in the most opens. Where possible, try to correlate that with Clicks (see below in the “Positive Action” section) because a subject line that results in opens (overall, a vanity metric) could be misleading and therefore result in a lower CTR, meaning the email ultimately failed to do what it was supposed to do. But test longer subjects… they might work well for your market. Don’t forget that the plain-text pre-header can be used to provide that subheadline goodness where the HTML version might have the “view on the web” stuff put in by your template. Don’t make it all about you… your product, service, features, etc. Make it about them, about their problems (and how you’ll solve it), about their opportunities, etc. Remember, it is email MARKETING and marketing should be all about the customer. HTML layouts are fine, but it is the content & Call to Action (CTA) that is most important. 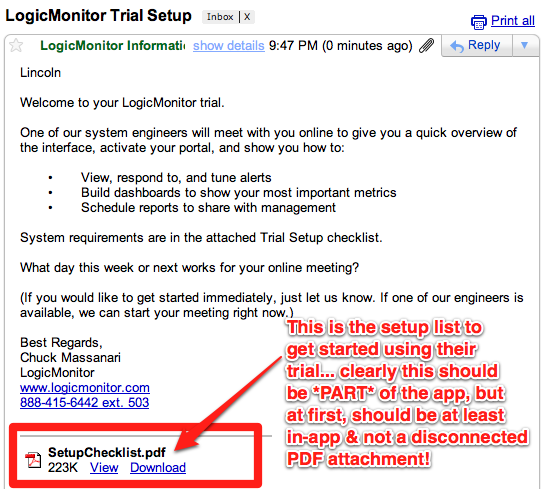 For example – even if for pre-sales indoctrination – don’t send them to a PDF directly or attach it to the email. Instead, take the content and put it in an area of the site or app and allow them to download the PDF from there, surrounded by additional CTAs. 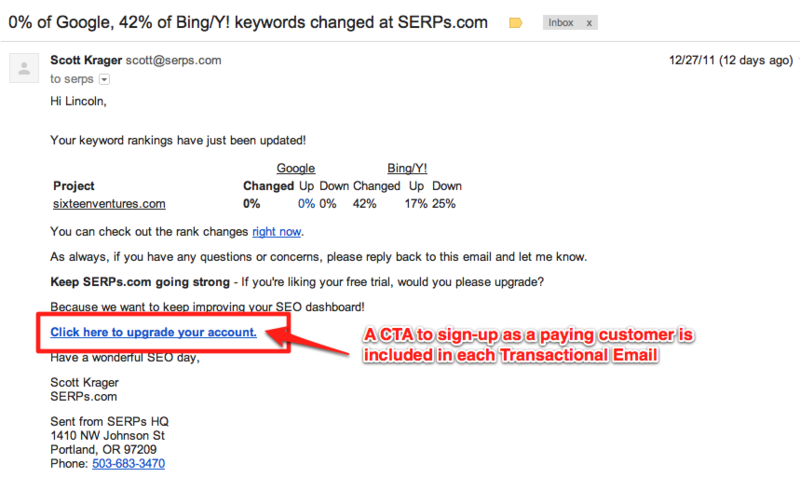 Those CTAs should be to drive them to the next step; use the app, sign-up for the trial, attend a webinar, etc. All roads lead back to the app and they all end up at conversion! That means sometimes you can just ask for the sale (while reminding the reader why they should convert) or you can make them an offer to sign-up right now. 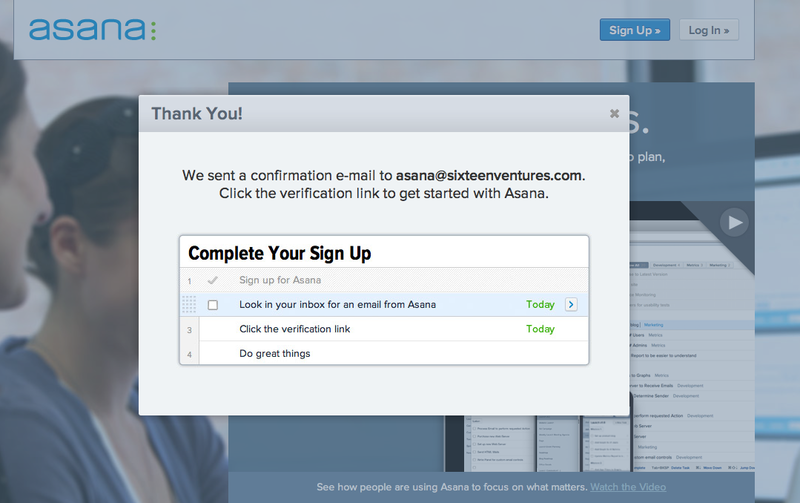 What SaaS Email Marketing / Engagement tools to use? For email marketing, Free Trial follow-up, etc. you can use a variety of techniques. Option 1 might be to roll your own follow-up process where you tag events in your app to send email via API through one of the vendors listed here. 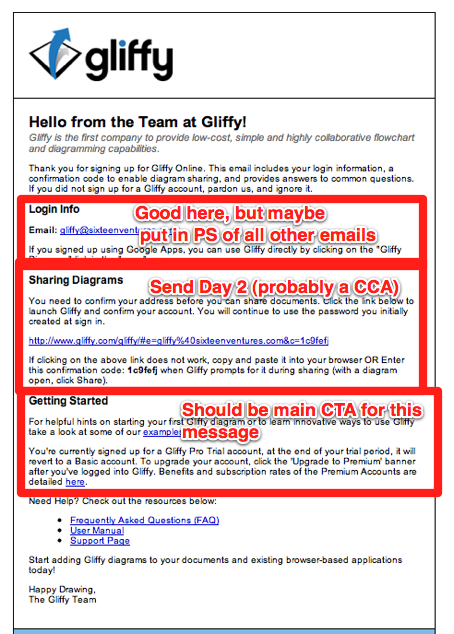 Option 2 might use a more traditional Email Marketing service with an auto-responder (not triggered or behavior-based, but better than nothing!). 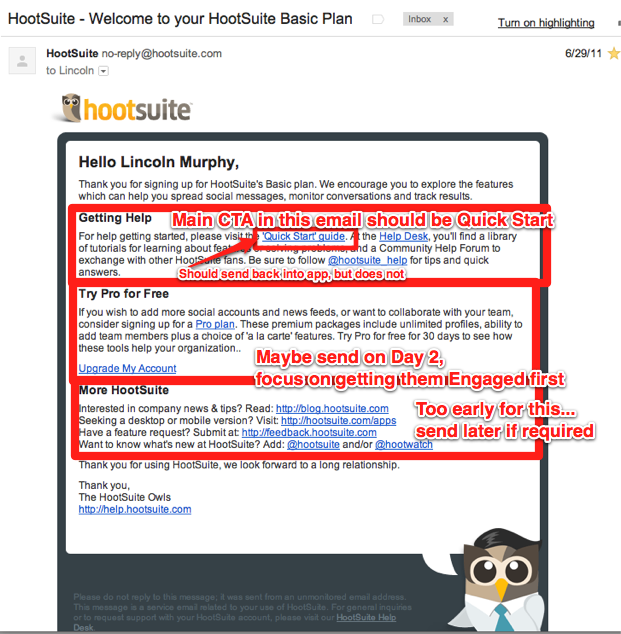 Option 3 could be to use one of the relatively new SaaS providers designed specifically for “lifecycle” email marketing. There are tons of email marketing providers, but those are the six that I have direct experience with, though I recommend you do your homework when selecting any vendor. There are tons of other “marketing automation” tools out there like Hubspot or Pardot… but that’s beyond the scope of this narrowly focused post. And many of those tools don’t do what some of these I’ve listed do. Well, there you have it… no guarantees that all of that will help you, but I bet it will. I know for most SaaS providers, the time it took to read this was more time than they spent on their entire email marketing & follow-up strategy!